Glamis-based company Agrico UK Ltd. has been shortlisted for the first Investors in People Awards. We are delighted to have been shortlisted for this award. To involve and inspire the next generation through our ‘Tattie Tastic’ project is something we’re very proud of. They have made it to the Best School and Business Partnership category in recognition of the ‘Tattie Tastic Project’, run as part of the Scottish Food and Drink Federation’s schools programme, A Future in Food. 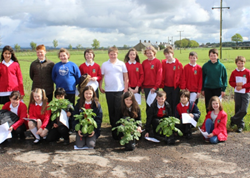 Now in its third year, the partnership has involved a class of Primary 6 and 7 children joining the seed potato business for a series of interactive lessons. By using the potato as a mechanism to teach them all about business and growing crops, it has helped shape their understanding of the product and the potato industry in the area they live. It has also shown them the extensive opportunities that exist within the food manufacturing industry. The awards, which received over 500 entries from all over the UK and will be presented in London next month, will acknowledge the best people management practices amongst Investors in People-accredited businesses. The winners across 15 categories, including Excellence in Leadership and Management and Social Responsibility, will be announced at a ceremony on June 23. Best School and Business Partnership will go to the partnership that demonstrates the strongest link between a school and employer and a strong creative approach with tangible benefits to both parties. Agrico are shortlisted with two other partnerships.